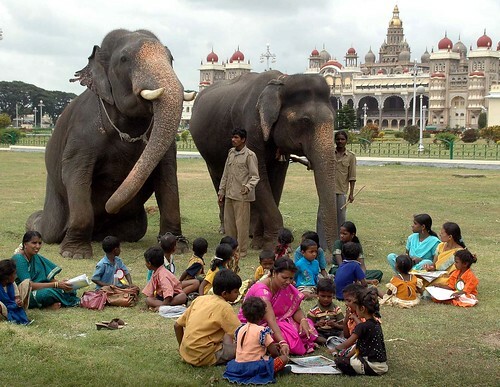 Children of mahouts ferrying elephants for the Dasara festivities in Mysore, and a couple of large gatecrashers, sit down for special classes conducted by department of public instruction at the main Amba Vilas palace in Mysore on Friday. The programme is conducted every year during Dasara. This entry was posted in Life Etcetera, Mysore-Bangalore and tagged Amba Vilas, Churumuri, Dasara, Mysore Dasara, Mysore Palace, Sans Serif. Bookmark the permalink.